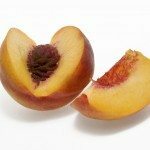 Dwarf peach tree varieties make life easier for gardeners who want a bounteous harvest of sweet juicy peaches without the challenge of caring for full-size trees. At heights of only 6 to 10 feet (2-3 m.), small peach trees are easy to maintain, and they’re ladder-free. As an added bonus, peach tree dwarf cultivars produce fruit in a year or two, compared to about three years for full-size peach trees. The most difficult task is selecting from so wonderful kinds of dwarf peach trees. Read on for a few tips on selecting peach tree dwarf cultivars. Small peach trees aren’t difficult to grow, but they are only moderately tolerant of cold temperatures. Peach tree dwarf cultivars are suitable for USDA plant hardiness zones 5 through 9, although some are tough enough to withstand chilly winters in zone 4. El Dorado is a medium-size, early summer peach with rich, yellow flesh and red-blushed yellow skin. O’Henry are small peach trees with large, firm fruit ready for mid-season harvest. Peaches are yellow with red streaks. Donut, also known as Stark Saturn, is an early producer of medium-sized, donut-shaped fruit. The freestone peaches are white with a red blush. Reliance is a good choice for gardeners as far north as USDA zone 4. This self-pollinating tree ripens in July. Golden Gem, favored for its excellent flavor, produces an early harvest of large, yellow fruit. Intrepid is a cold-hardy, disease-resistant peach tree that blooms in late spring. The sweet, yellow-fleshed fruit is ideal for baking, canning, freezing or eating fresh. Redwing produces an early harvest of medium-sized peaches with juicy white flesh. Skin is yellowish covered with red. Southern Sweet produces medium-sized freestone peaches with red and yellow skin. Orange Cling, also known as Miller Cling, is a large, clingstone peach with golden yellow flesh and red-blushed skin. Trees are ready for harvest mid- to late season. 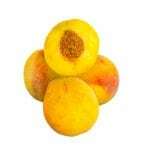 Bonanza II produces large, sweet-smelling peaches with attractive red and yellow skin. Harvest is in midseason. Redhaven is a self-pollinating tree that produces all-purpose peaches with smooth skin and creamy yellow flesh. Look for peaches to ripen in mid-July in most climates. Halloween produces large, yellow peaches with a red blush. As the name suggests, this late peach is ready for harvest in late autumn. Southern Rose ripens early, producing medium-size yellow peaches with a red blush.